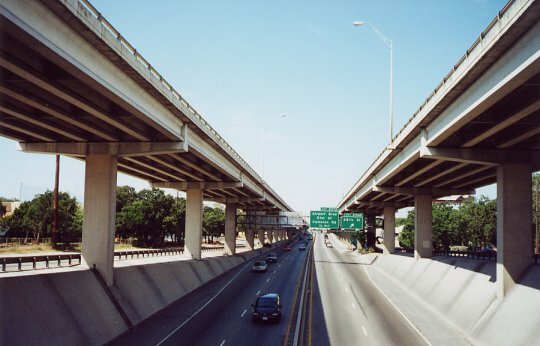 Interstate 35 was Austin's first freeway, and it's definitely Austin's worst freeway. Heavy traffic, poor design, and lots of trucks combine to make this a very dangerous freeway. Austin has many scenic roadways, but Interstate 35 is definitely not in that category. In fact, there is nothing scenic about the IH-35 corridor in Austin. 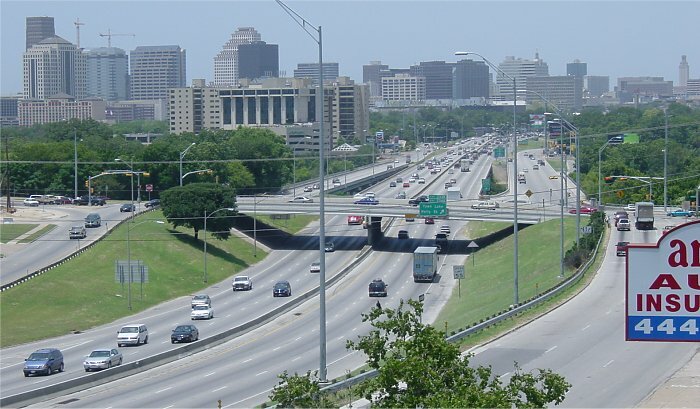 Most of I-35 was originally constructed in the 1950's, with the dedication of the downtown section occurring in May, 1962. 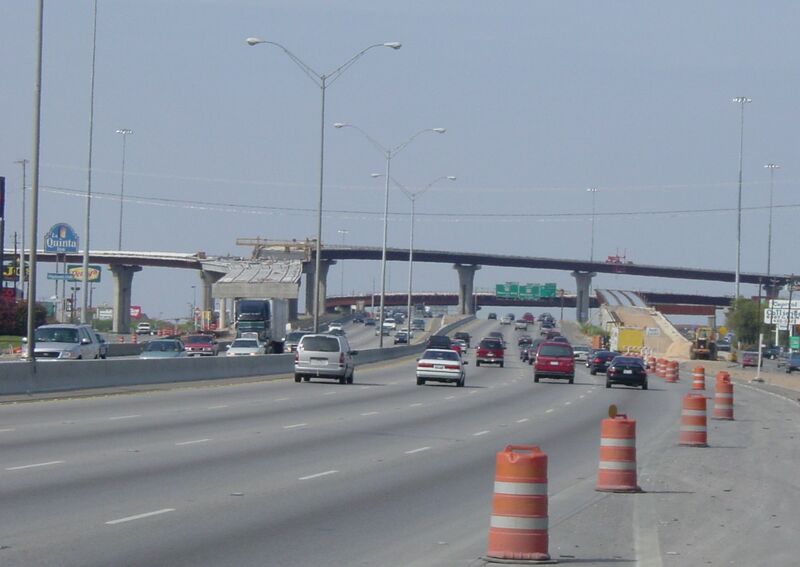 Much of I-35 has not been improved since the original construction. In 1975, a second deck was added for a 2-mile stretch north of downtown. I-35 is presently the subject of a major investment study for potential improvements. This study has been underway for years, and will continue for at least 2 more years. In fact, I-35 has been under study almost continuously since the 1980's. As of July 2001, a firm plan for the freeway is beginning to develop. The proposal looks very promising for turning IH-35 into an impressive freeway. See the July 10, 2001 intelligence report for full details. 1948 Right-of-way acquisition begins for IH-35 north of Austin. 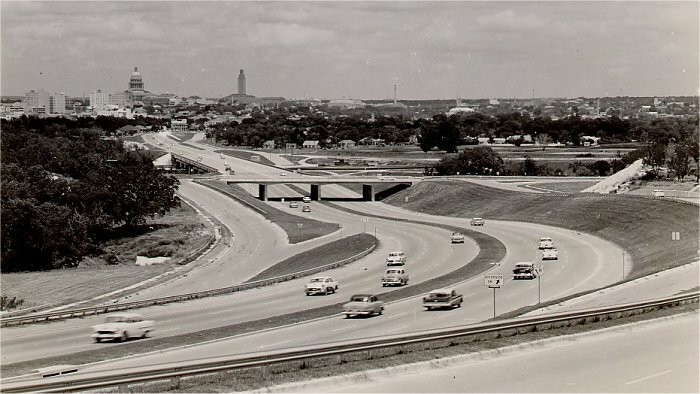 1954 IH-35 is complete from north of downtown northward by June 1954. The facility is not yet fully access controlled, however. 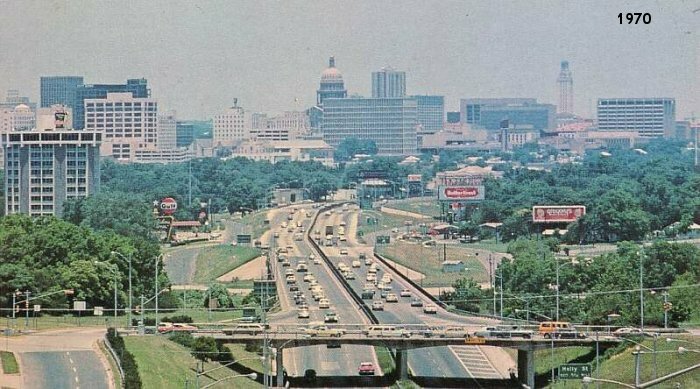 May 29, 1962 Freeway through downtown Austin officially opened. Freeway is complete all the way through Austin. 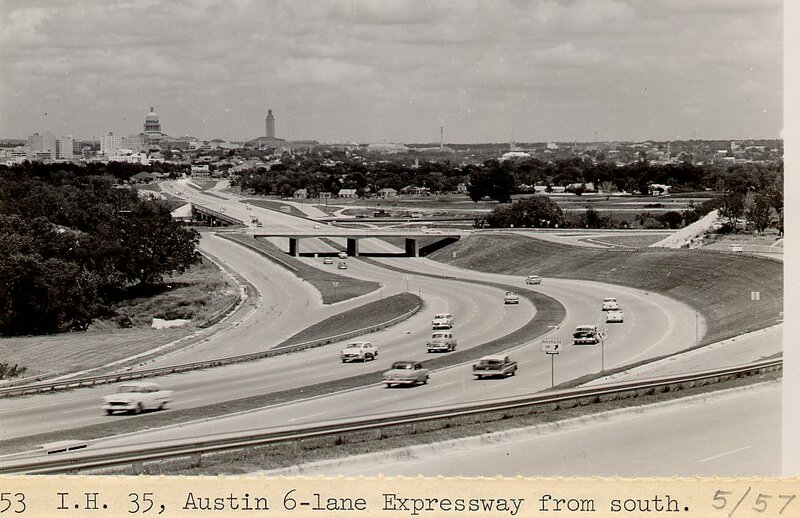 1965 Freeway is completed around Georgetown, north of Austin. The Inner Space Cavern is discovered during construction in 1963. 1997 Interchange at 183 is completed. The four-level interchange features 2 direct connectors. 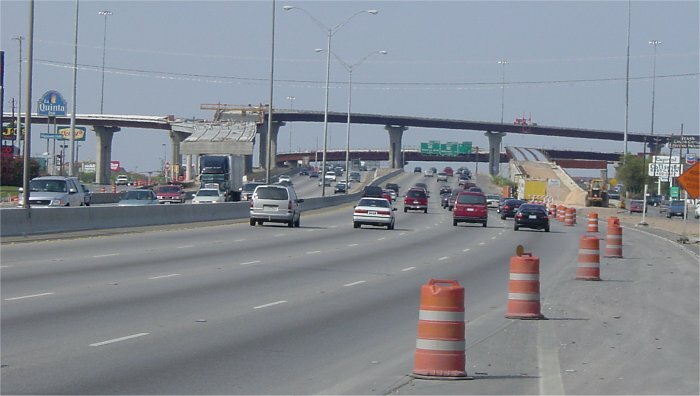 2000 Work begins on the 5-level stack at IH-35 and US290/TX71. The interchange will be complete around 2004. 2001 Four direct connectors at the interchange with 290 north are completed. 2001 and beyond The major investment study continues. The existence of a cemetery adjacent to a narrow section of the freeway complicates expansion plans. (high resolution 309k) The upper photo is dated May 1957. In 1970 (the middle photo), the feeder roads did not extend over Towne Lake, and there were only 2 northbound lanes on IH-35. The original Riverside bridge was in place, and you could still see the state Capitol building. (high resolution 93k) A typical view south of Austin. View looks north. Photo taken 25-March-2001. (high resolution 179k) Looking north from the Stassney overpass, which is just south of US 290/TX 71. The cranes in the background are with the stack construction. Photo taken 25-March-2001. (high resolution 157k) A typical section of IH-35 south of downtown, looking north from the Oltorf Street overpass. The freeway has only 6 lanes south of downtown. Photo taken 25-March-2001. (high resolution 181k) Looking south at the Cesar Chavez (formerly 1st Street) intersection. The southbound main lanes use the original underpass constructed in the 1950s. Notice the poor geometrics on the exit ramp. See a view of this overpass during construction in March 1960 (160k). This section of IH-35 is planned to be a 12 lane freeway, fully depressed below grade through the downtown area. However, that is in the distant future (after 2010). Photo taken 25-March-2001. (high resolution 184k) Looking north at the southern end of the double deck section. Photo taken 25-March-2001. Views of the double deck section. The lower level is still in its 1950's configuration, with extremely poor (and dangerous) geometrics. Photos taken summer 2000. "In order to accommodate the proposed alternative to depress the mainlanes and remove the northbound upper deck, the proposed alternative requires 65 to 100 feet of right-of-way from Mt. Calvary Cemetery. Engineers have investigated the cost and requirements to purchase 500 to 1000 graves from families of the deceased at Mt. Calvary Cemetery. Through the study engineers discovered that TxDOT does not have the authority of eminent domain over cemeteries." "Mr. Zielinski's response was that he felt the project would receive a lot of opposition. There are some very prominent families who have family members buried in the graves at risk. He informed the group that he had already received several calls inquiring about the project and heard rumors regarding the process." "Shifting the right-of-way requirements to the west is being look at more closely. This leaves the team with the possibility of only three of the four original alternatives. The alternatives were, acquire from right-of-way from Mt. Calvary, the University of Texas, or St. David's Hospital; elevate the additional lanes; or do nothing." (high resolution 150k) Looking north at the intersection with US 290. 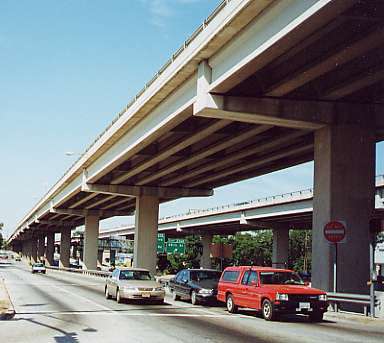 The four direct connector ramps were nearing completion as of March 2001. Photo taken 25-March-2001. (high resolution 194k) Looking north at the interchange with US 183. This interchange was completed in 1997. Photo taken 25-March-2001. (high resolution 194k) Looking north in Round Rock. 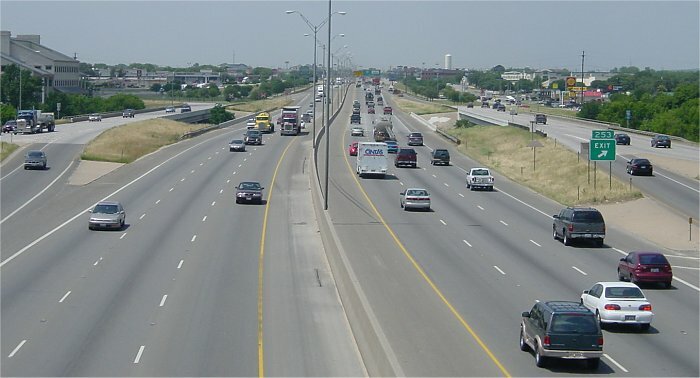 This is a typical view of the 6-lane freeway north of Austin. 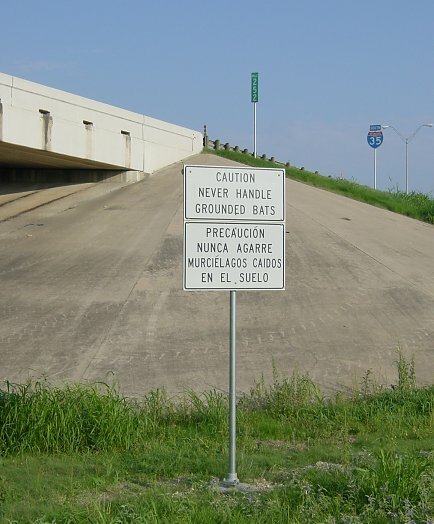 A colony of Mexican Free-tailed bats has made an IH-35 overpass its home. When I took these photos at 6PM, there was a din of high-pitched bat calls underneath the overpass, in addition to the presence (and smell) of guano. 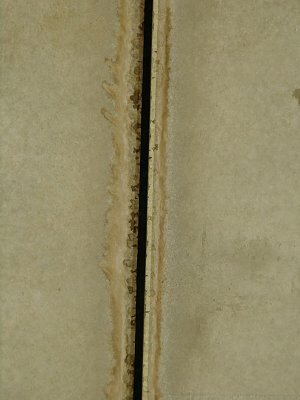 There are very thin cracks between the precast concrete beams, which apparently are just right for the bats. This colony has been living underneath the overpass for years, and it is an offshoot of the much larger bat colony that lives underneath the Congress Avenue Bridge downtown. One of these days I'll go there at dusk and get some photos as they go out for their nightly feeding.